The verdict is in in the guilty or not guilty episode of the traveling insulation. Thanks to all of my new friends for stickin up for me and proclaiming my innocence! 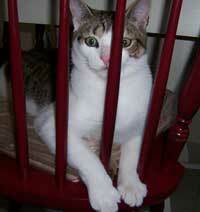 Otherwise, Mommy mighta put me in time out like this! Instead, I'm free! But, I could'a been doing her a favor ya now, like makin Daddy get the neighbor man come over to help us finish the downstairs. There's only a little bit left to do so I mighta just been trying to help em a little. Now I think I'll just watch and see how long it takes before the walls gets fixed. 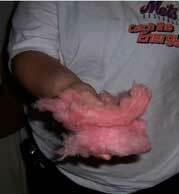 I thinks I see a little pink stuff peeking through... heh heh. 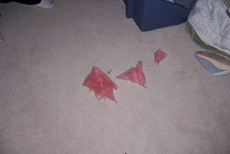 Clumps of Insulation left in various places around the house including the 'rents bedroom, hallway near the alleged culprits bedding, and near the food dish. 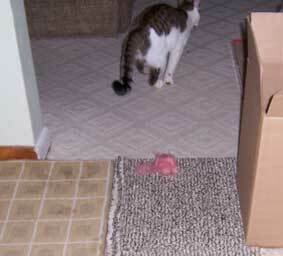 Kitty culprit caught on film fleeing the scene. Motive: Mommy out late two nights in a row. Verdict: Guilty or not guilty? Yes, It's all about us. My humans had decided it was time to find and adopt a cat. 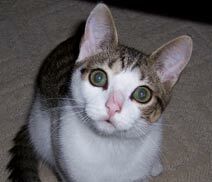 First, they went to petfinder.com and looked obsessively online at pictures of the cats in the area, over and over. Then they finally got off their butts and came to the shelter to find me (Beau, that's me). I spotted Daddy Bob and it was love at first sight. I sent him a look that told him to get me the hell out of the cage. He thought I was so cute, I settled in comfortably in his arms and that did the trick. Little did he know that when I finally got home, that my true kittenish behavior would come out full force! Their house was much bigger than my cage so I needed to see just how big it was. I can never seem to remember how long the house is so I have to check the measurements by running from end to end at least a few times a day. My new playmates, Mommy & Daddy were getting tired out a liiiiitttle too quickly, so... they decided to find me someone to keep me company during the day. Who do they bring me? 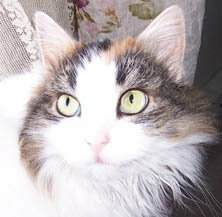 Angie, this long haired calico/part ragdoll came prancing in like she was Queen Sheba or something. I taught her a quick lesson about who's boss. Just because I took a few hits to the nose doesn't mean anything! I think we have it worked out, I just wait till Mommy isn't around then I show her who's boss.